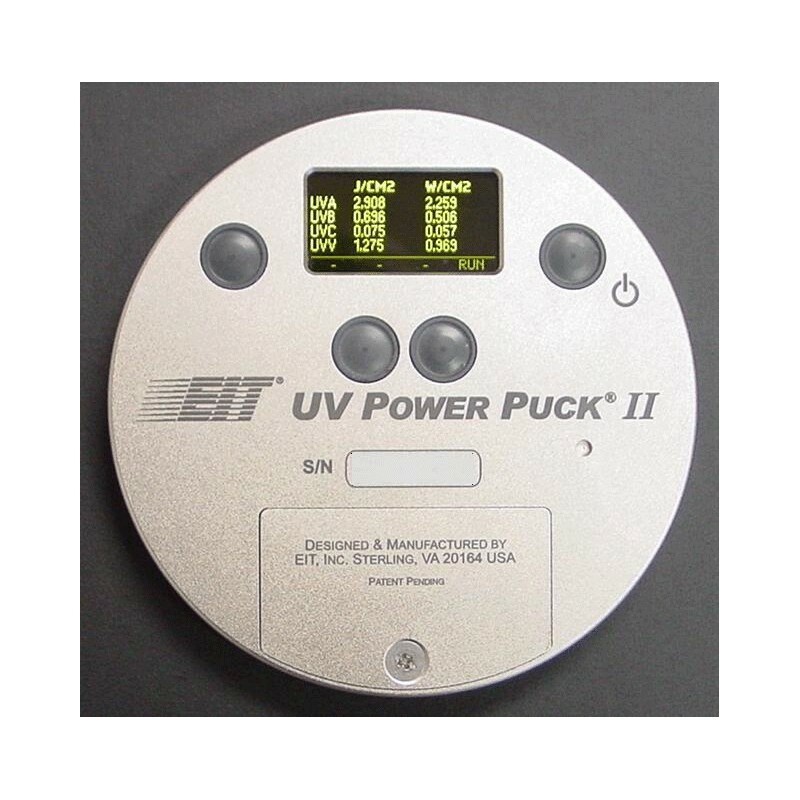 The EIT POWERPUCK® II AND UVICURE PLUS II RADIOMETERS measure UV Peak irradiance (microW/cm2, mW/cm2, W/cm2) and total energy density (microJ/cm2, mJ/cm2, J/cm2) of one spectral bandwidth (Uvicure Plus II) or 4 different bandwidths simultaneously (UV Power Puck II). The radiometers that first set the standard for the UV industry are now setting a new standard with advanced features and an easy to read display, multiple user selectable modes, and PC communication for data logging and trending capabilities, and process verification. 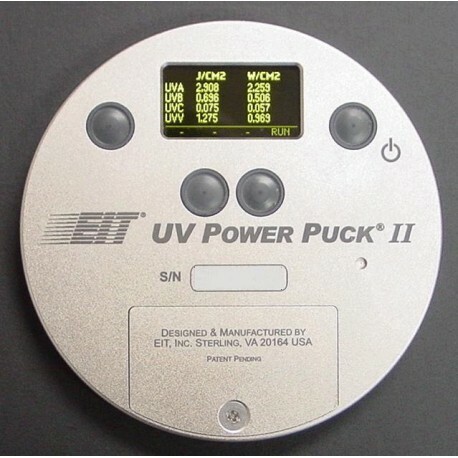 The new EIT Instrument Markets UVICURE Plus II and UV Power Puck II are advanced versions of the UVICURE Plus and UV Power Puck widely used throughout the global UV industry. With user selectable sample rates, these new instruments can be used for fast conveyor lines or slower lines, and measurements are compatible with other EIT products. Easy to Read - Data Display of All 4 Bands. Setup Function - Provides user selectable instrument default modes for data analysis and comparison, screen, and operational settings. Reference Mode - Used for comparison between readings. Can be useful for system setup and troubleshooting. The user can store the selected UV reading in the radiometer as a base line or reference reading, then compare that reading to another. The radiometer will display both readings and indicate the percentage of change between readings. Data is displayed in mJ/cm2 and mW/cm2, and percentage. Graph Mode - A graph illustrating the collected UV irradiance and energy is displayed for each of the UV bands. Data is expressed in mW/cm2 vs. time. Graphs at right illustrate both a one and two-lamp system. Smooth On Data: Compatible with previous Power Puck versions. Smooth Off Data: Compatible with UV PowerMAP at over 2000 samples per second. Communications Port - Serial communication protocol between unit and PC/PDA. Download collected data to a computer for statistical analysis and data logging, and process verification. Carrying Case Dimensions 10.75 x 3.5 x 7.75 inches 274 x 89 x 197 mm (W x H x D).